Here at Frieda’s Specialty Produce, we’ve always been different, just like our products. Genuine, spirited, forward-thinking, family-first people. It’s who we are and who we’ve always been, ever since our trailblazing founder Dr. Frieda Rapoport Caplan first introduced the kiwifruit to the U.S. in 1962. Innovation and authenticity are deeply rooted here at Frieda’s. After all, our family’s been inspiring new food experiences with oh-so-good-for-you specialty fruits and veggies for more than 50 years. 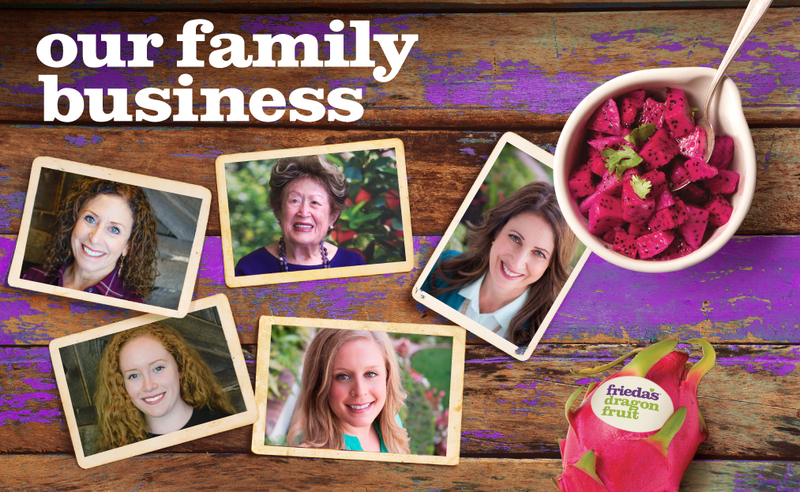 Frieda’s two daughters, Karen Caplan and Jackie Caplan Wiggins, head up the family company and the third generation, Karen’s daughters Alex Jackson Berkley and Sophia Jackson, have joined too. (Why, yes, we are WBENC certified!) We market and distribute an amazing variety of fruits, vegetables, and gourmet items in our ongoing quest to change the way America eats. From sunny, beach-strewn Orange County, California, we distribute to supermarkets, foodservice companies, and wholesalers all across the continent. We’re family and friends with heart, who work hard, play fair, and laugh a lot. We care about the foods we put in our bodies, and we care about the land and the people who grow our food. We’ve learned that diversity is nature’s way of ensuring a healthy planet, and diversity in fresh fruits and vegetables helps us nourish body and soul. We are committed to delivering the highest quality produce while minimizing our impact on the environment — from the field to the supermarket. If it’s good for the earth, it’s good for us. Good food equals joy. We believe that inspiration is only an ingredient away.